I am in the process of recreating an old house that was next door to me when I was really young ( it burned down when I was 8 ) and documenting the inhabitants with a graphic novel that I am working on. The work I am doing is all based on my memory from going over there with Jean, old photos and city ground plans. The inhabitants would go on to create some of the greatest American Music, and having them next door inspired me for life. They also were really great guys. All of the elements are being made in 3ds Max, 3D Coat , Knald and Substance painter by myself at night. This is all a WIP section I thought of posting so I can see the progress and get an overhead view of everything as well as show my current work. The entire space I am building using Max, Substance, 3d Coat, knald, Quixel libraries and PSD. Once a Normal is made I bring it into Substance and paint the areas - then back to Max. 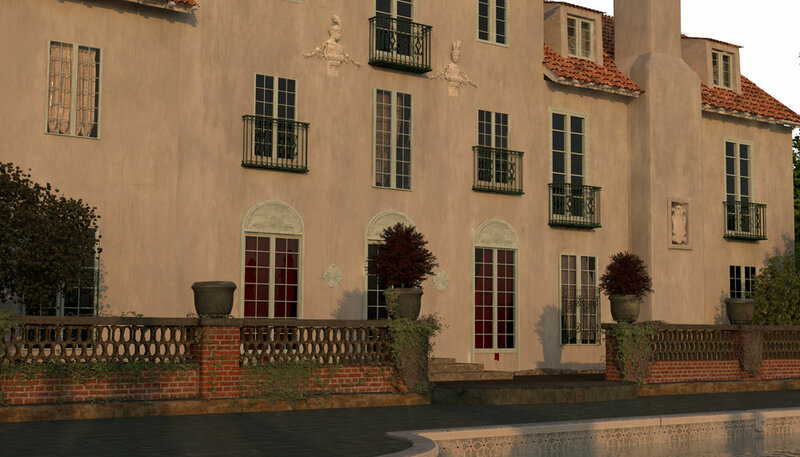 The pool area has detail vines and plants as well as the sculpted elements from 3Dcoat. ground tiles and pool decor all made in 3d Coat. Wider View of the WIP elements were created in as seen above ..